In my previous article I mentioned about upcoming new release of Gallio / MbUnit. Feel free to download the Release Candidate and try it for yourself. In this post I’ll talk about another new feature. 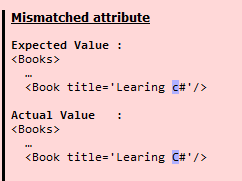 In the example above we’re comparing XML strings. There’s another overload that instead of strings takes TextReader objects. As you can see, the formatting of XML is different, but our test still succeeds since it represents the same XML. Let’s now make a small test. We know that XML is case-sensitive language. What is going to happen if you we mismatch case? Let’s make expected value for one of the book title ‘Learning c#’ instead of ‘Learning C#’. Wait a second. But what if in my application I don’t care about case-sensitivity for my data? Well, in this case guys from the Gallio team provided us with an optional parameter of type XmlOptions. Therefore, if we add XmlOptions.Loose parameter to our Assert.AreEqual, our test is going to pass. You can find more information on XmlOptions in the Gallio Wiki site. This assertion method checks if an element or an attribute can be found in a specific XML document. The first parameter of Assert.Xml.Exists method is an Xml document. Like in Assert.Xml.AreEqual method you can represent Xml document as a string or a TextReader object. The second parameter is an Xml Path that can be either a string in format “/element[/element]:attribute” or an object that implements IXmlPathLoose interface. The third parameter is already familiar to us XmlOptions object. Let’s look at a specific example where will check if Book element exists. For completeness let’s show a separate example where we will be looking for title attribute. This method takes the same parameters as Assert.Xml.Exists. Assert.Xml.IsUnique fails if an element is encountered more than once in Xml document. I expect that you will not utilize this method as much as other two methods. The following code is going to fail because we have two Book elements in out Xml. I hope you find it useful and I didn’t waste mine and your time because my wife and kids never going get this hour back. Gallio wiki site is a great place to learn more about XML Assertions. Gallio / MbUnit is an open source project and they always looking for new contributors. If you consider joining the project, click here to learn how.